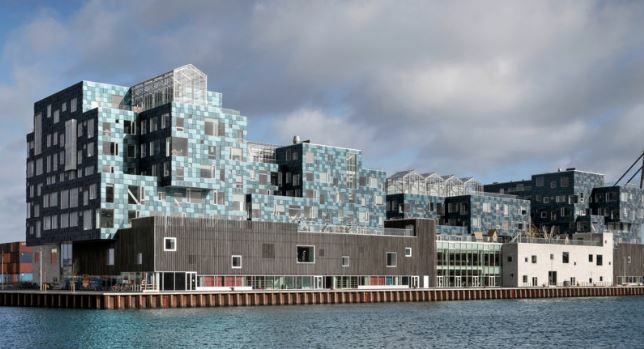 Geweldig voorbeeld van hoe het ook kan. De International School Nordhavn in Copenhagen is volledig bedekt met zonnepanelen. Op het pand van 25.000 vierkante meter zijn maar liefst 12.000 zonnepanelen aangebracht. Die leveren ongeveer de helft van de benodigde stroom voor de school. Uiteraard zijn er zonnepanelen op het dak gelegd, maar ook de facade is voorzien van zonnepanelen door architect C.F. Møller en dat zier er wat mij betreft fantastisch uit. CIS Nordhavn is a new school building for Copenhagen International School, which is located on a prominent site in Copenhagen’s new Nordhavn district. The school is designed to link the school premises with the public sphere in the urban environment, and give the school an open ambience. The promenade outside the school will become an urban port-side space providing opportunities for relaxation and various activities. The main school building is subdivided into four smaller towers, each specially adapted to meet the needs of children at different stages of development. For example, the classrooms for the youngest pupils are particularly large: A full range of functions will take place in and around the classroom, each of which has designated green spaces and areas with drama/performance facilities, PE, etc. The towers have from five to seven storeys. The subdivision of the school into four units also creates identity and makes it easier for people to find their way. All four school units are built on top of the ground-floor base, which contains common and more extrovert activities, including a foyer, sports facilities, a canteen, library and performance facilities. The common areas will be open for school and local community events. The base includes a shared roof terrace which will function as a school playground for the whole school – and as a secure environment for the youngest pupils in particular. The school building’s unique facade is covered in 12,000 solar panels, each individually angled to create a sequin-like effect, which will supply more than half of the school’s annual electricity consumption. The solar cells cover a total area of 6,048 square meters making it one of the largest building-integrated solar power plants in Denmark.